Yoga for Productivity. Start Monday with gentle invigorating movement leaving you feeling refreshed and ready to tackle the week. This class can help to boost memory, concentration and productivity. Monday 4 February, 8 - 8.45am, Humanities Studio. Find more activities from Warwick Sport here. (This session is open to staff and students). 'Take a Break' sessions where staff and students can access advice and information in relation to wellbeing and mental health in an informal setting. Light refreshments (i.e. tea and coffee) will be provided and the session will be attended by representatives from the different teams in the Wellbeing Support Services. Monday 4 - Friday 8 February, 12 - 2pm, Senate House Foyer. (This session is open to staff and students). PGR Potential Advantage drop-in session. Monday 4 February, 1 - 2.30pm, Wolfson Exchange, Library. Register your attendance for the PGR student seminar here. (This session is open to Postgraduate Research students only). Wellbeing Warwick Secret Challenge. You can read more about Warwick Secret Challenge here. Monday 4 February, 2 - 4pm, SH 2.05, Second Floor Senate House. Register for the Wellbeing Warwick Secret Challenge here. (This session is open to staff and students). Respect Day. Departments to promote Dignity and Respect at Warwick - what will your department be doing? Tuesday 5 February. (This session is open to staff and students). Give it a Go! Painting YMCA accommodation. Warwick Volunteers will help paint accommodation for local young people, aged 16-25 who are homeless, or at risk of homelessness. Tuesday 5 February, 9.30am - 2pm. You can find more information about Warwick Volunteers Give it a Go! sessions here. (This session is open to students only). Student Minds Mental Health in Sport Workshop to increase awareness of mental health and promote an inclusive and supportive environment in physical activity and sport. Tuesday 5 February, 10 – 11.30am, Cryfield. Register to attend the Mental Health in Sport Workshop here. (This session is open to staff and students). How to Manage Your Emotions to Improve Relationships at Work. Managing our emotions is an important aspect of emotional intelligence that we could all be developing for ourselves. In doing so we are more likely to respond to others with respect and consideration, whilst also feeling able to effectively handle relationship challenges in the workplace. Tuesday 5 February, 11.45am – 12.45pm, 2.006, WBS. Register to attend the Emotional Intelligence session here. (This session is open to staff only). Curator-led Sculpture Trail. Join one of the Mead Gallery curators for an hour-long walking introduction to a selection of sculptures, including Barry Flanagan’s Acrobats. Feel free to bring a packed lunch. Tuesday 5 February, 12 - 1pm, meet outside the Creative Learning Space in Warwick Arts Centre. Find more information and register to attend the Sculpture Trail here. (This session is open to staff and students). Spirituality and Wellbeing. Kate Pearson, our Anglican Chaplain, will explore the evidence of a link between spirituality and wellbeing. We will explore what spirituality is and look at resources that may help us explore our own spirituality. Tuesday 5 February, 12 - 1pm, Chaplaincy. Register to attend for the Spirituality and Wellbeing session here. (This session is open to staff and students). Wellbeing Walk. Tuesday 5 February, 12.30 - 1pm, Meet Ground Floor Library. Find more activities from Warwick Sport here. (This session is open to staff and students). FULL Menopause: Stress, nutrition, and exercise by Julie Dennis (nutritionist, personal trainer, mental health first aider and menopause expert) from Henpicked. Tuesday 5 February, 1 - 3pm, OC0.02 Oculus. Find more information about the menopause talk, and register your place, here. This session is now full, please complete the registration form if you wish to be added to the waiting list. (This session is open to staff and students). Dignity and Respect This workshop will explore dignity and respect, and how they are essential to our professional and personal lives. Participants will have a chance to consider why dignity is important, and the consequences of actions that violate human dignity. Tuesday 5 February, 1 - 3pm, R3.25, Ramphal. Register to attend the Dignity and Respect session here. (This session is open to staff only). PGR Wellbeing Hour. Come and speak to the Postgraduate Community Engagement Team and Wellbeing Support Services teams, share a wellbeing tip in exchange for tea, coffee and fruit, and read the wellbeing tips left by others to get some inspiration! Tuesday 5 February, 2 - 3pm, Wolfson Research Exchange. Find more information about PGR Wellbeing Hour here. (This session is open to Postgraduate Research students only). Study Happy Kirby Corner. Take a break and join Study Happy for biscuits and chat! Tuesday 5 February, 2.45 - 4.15pm, Library Floor 1. You can find more information about Study Happy Kirby Corner on the Library's website here. (This session is open to students only). PG Tips. Join the PG Hub team for a study break, to meet other postgrads, and to share tips on postgrad life. Tuesday 5 February, 3 - 4pm, Relaxation Room, PG Hub. You can find more information about PG Tips here. (This session is open to Postgraduate students only). Drop-in Climbing Session. These sessions will be led by Warwick Sports' climbing instructors. No climbing experience is necessary. Tuesday 5 February, 4 - 5.30pm. If you are interested in this session please email j dot tanton at warwick dot ac dot uk. (This session is open to staff and students). 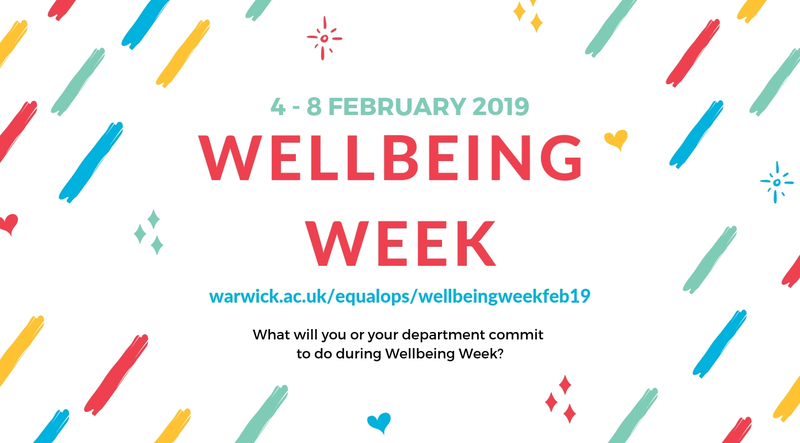 Main Wellbeing Event with stands showcasing internal and external wellbeing services including ‘Take a Break’ sessions, Warwick Sport activities and massages from a sports massage therapist, Healthy Lifestyles, Financial wellbeing, Study Happy, Warwick Learning Vouchers, Warwick WI, and Kindness. Wednesday 6 February, 10 - 3pm, Chancellor's Suite Rootes Building. (This session is open to staff and students). FULL CPR & Defibrillator hands-on practice session. Wednesday 6 February, 10 - 10.45am, R0.14, Ramphal. Register to attend the CPR & Defibrillator session here. This session is now full, please complete the registration form if you wish to be added to the waiting list. (This session is open to staff and students). Transforming Running into Mindfulness. TRiM focuses on developing mindfulness through a mindful approach to running. An accessible way to experience the benefits of physical activity for health and wellbeing. This six-week course costs £20 for University of Warwick students. Wednesday 6 February, 10 - 11.30am, Cryfield Pavillion. Book on the TRiM course here. (This session is open to students only). Give it a Go! Tree Care -Friends of Canley Green Spaces. Seven years ago, Friends of Canley Green Spaces and Warwick Volunteers planted 420 trees that have now grown into a woodland. Volunteers will be revisiting the tree planting site in Park Wood, to cut away unwanted vegetation from around the trees. Wednesday 6 February, 10.30am - 2pm, meet at Costa Coffee by the Rootes Building. You can find more information about Warwick Volunteers Give it a Go! sessions here. (This session is open to students only). Zumba Strong Class. These sessions are free of charge. Wednesday 6 February, 10.30 - 11.15am and 11.30 - 12.15pm, Desso Hall. Book onto the 10.30am Zumba class here and book onto the 11.30am Zumba class here. 'Take a Break' sessions where staff and students can access advice and information in relation to wellbeing and mental health in an informal setting. Light refreshments (i.e. tea and coffee) will be provided and the session will be attended by representatives from the different teams in the Wellbeing Support Services. Monday 4 - Friday 8 February, 12 - 2pm, Chancellor's Suite Rootes Building. (This session is open to staff and students). Pop-up #BeatTheBear. Take on your favourite university mascot 'Terry the Bear' in brand new sporting challenges around campus every Wednesday 12 - 2pm. Be in with a chance of winning some great prizes. Wednesday 6 February, 12 - 2pm, TBC. Find more activities from Warwick Sport here. (This session is open to staff and students). Study Happy Mindfulness. These free weekly workshops are a great way to try different mindfulness techniques if you are a beginner, and find dedicated space and time for regular practice. Wednesday 6 February, 1 - 2pm, Seminar Room, Library Floor 2. You can find more information about Study Happy Kirby Corner on the Library's website here. (This session is open to students only). FULL CPR & Defibrillator hands-on practice session. Wednesday 6 February, 1.15 - 2pm, OC1.01 Oculus. Register to attend the CPR & Defibrillator session here. This session is now full, please complete the registration form if you wish to be added to the waiting list. (This session is open to staff and students). PGT Wellbeing Hour. Come and speak to the Postgraduate Community Engagement Team and Wellbeing Support Services teams, share a wellbeing tip in exchange for tea, coffee and fruit, and read the wellbeing tips left by others to get some inspiration! Wednesday 6 February, 2 - 3pm, PG Hub main atrium. Find more information about PGT Wellbeing Hour here. (This session is open to Postgraduate Taught students only). Presentation and workshop of the Phase 1 report 'Improving students' wellbeing in the teaching and learning environment'. Wednesday 6 February, 2.15 - 3.30pm, Humanities Studio (H0.76, Humanities Building). Register to attend the presentation and workshop here. (This session is open to staff and students). First Steps to Fitness. For anyone getting back into exercise and looking to increase your knowledge and improve fitness, health and wellbeing. This course costs £15 for University of Warwick students & staff. Thursday 7 February, 7.15 - 8.15am, Functional Studio, Sports Centre. Find more information and book your place on First Steps to Fitness here. (This session is open to staff and students). Student Funding stand. Speak to Student Funding during Wellbeing Week and National Student Money Week in the Atrium at the SU. Thursday 7 February, 11am - 12pm, Atrium Students' Union. (This session is open to students only). Knot Just Knitting. Come and learn to knit and crochet with a friendly group in the Chaplaincy. All materials provided. Thursday 7 February, 1 - 3pm, Chaplaincy. You can find more information about Knot Just Knitting here. (This session is open to students only). Wellbeing and Failure (Dr Jonathan Heron, IATL). Taster session of the IATL Module Understanding Wellbeing Theory and Practice. Thursday 7 February, 2 - 4pm, SH 2.05, Senate House. Register to attend the Wellbeing and Failure session here. (This session is open to staff and students). Wellbeing Warwick Secret Challenge. You can read more about Warwick Secret Challenge here. Thursday 7 February, 2 - 4pm, SH 2.05, Second Floor Senate House. Register for the Wellbeing Warwick Secret Challenge here. (This session is open to students only). Drop-in Climbing Session. These sessions will be led by Warwick Sports' climbing instructors. No climbing experience is necessary. Thursday 7 February, 4 - 5.30pm. If you are interested in this session please email j dot tanton at warwick dot ac dot uk. (This session is open to staff and students). Disability Football. Fun and friendly disability football sessions for all needs and abilities. Thursday 7 February, 4 - 5.30pm, 4G football pitch (next to Cryfield Sports Pavilion). To find out more and get involved, contact Marcus dot Webber at warwick dot ac dot uk. (This session is open to staff and students). No Kit No Problem. Build resilience and release stress through a combination of low impact movement, body weight exercises and stretching all in the comfort of your own clothes. Thursday 7 February, 5.30 - 6:15pm, Warwick Sport Humanities Studio. Find more activities from Warwick Sport here. (This session is open to staff and students). Warwick Volunteers Crafting Happiness. Volunteers design and produce craft-making kits, which are donated to University Hospital Coventry and Warwickshire for patients to use during their stay and also design custom made cards to send to seriously ill children through the charity Postpals. Thursday 7 February, 6 - 8pm, OC1.09, Oculus. You can find more information about Crafting Happiness here. (This session is open to students only). Student Minds Mental Health in Sport Workshop to increase awareness of mental health and promote an inclusive and supportive environment in physical activity and sport. Friday 8 February, 11am – 12.30pm, Cryfield. Register to attend the Mental Health in Sport Workshop here. (This session is open to staff and students). Motivation and Productivity. This is for individuals who would like to understand more about factors that can impact motivation and productivity, and what to consider when seeking to increase and improve motivation and productivity. Friday 8 February, 10am - 12pm, Wellbeing Support Services, Senate House. Find more information and register to attend Motivation and Productivity here. (This session is open to students only). Lunchtime run. Friday 8 February, 12.15 - 1pm, meet at University House (by pedestrian crossing). Find more activities from Warwick Sport here. (This session is open to staff and students). Study Happy Creative Chillout. Study Happy have teamed up with the Creative Learning Team from Warwick Arts Centre to bring some colour in your Library life! Join in and try some relaxing, creative activities. Thursday 7 February, 1.30 - 4.30pm, Seminar Room, Library Floor 2. You can find more information about Study Happy Creative Chillout here. (This session is open to students only). Dignity and Respect. This workshop will explore dignity and respect, and how they are essential to our professional and personal lives. Participants will have a chance to consider why dignity is important, and the consequences of actions that violate human dignity. Friday 8 February, 1.30 - 3.30pm, R1.03, Ramphal. Register to attend the Dignity and Respect session here. (This session is open to staff only). Want to tell others about this event? Download this poster and digital slide to display in your department. Warwick Sprint Programme - the Sprint programme has been introduced for all female students, to help you take hold of your personal development and help realise your ambitions. Run. Jog. Walk. Get your feet out and about and run, jog or walk at your speed with a like-minded community of movers (Available to everyone. Free sessions for all abilities). Warwick Sport Wellbeing Classes. Enjoy a range of free health and wellbeing classes (booking required). All classes are suitable for beginners.